...proposes to amend the essential programs and services funding and distribution formula and process to improve the equity and adequacy of general purpose aid to education. ...directs the Commissioner of Education to convene a task force to develop a proposal for a more equitable distribution of kindergarten to grade 12 state education funding. ...provides an adjustment for a school administrative unit that is a minimum subsidy receiver if its percentage of economically disadvantaged students is greater than the state average. ... amends the annual targets for the state share percentage of the statewide adjusted total cost of the components of essential programs and services. ...removes all references pertaining to the allocation of federal resources from the statutory provisions of the Essential Programs and Services Funding Act. ...directs the Department of Education to have an independent agency not previously involved with the essential programs and services funding formula review the essential programs and services model to analyze the impact of its implementation on children from economically disadvantaged areas, the funding shifts experienced by small rural schools and the result of the regional salary adjustment variable and the economically disadvantaged student variable on the equity of the distribution of state aid to municipalities for education and to provide a report to the Joint Standing Committee on Education and Cultural Affairs by December 1, 2011. The joint standing committee is authorized to submit a bill relating to the report to the Second Regular Session of the 125th Legislature. ...requires that, beginning in fiscal year 2013-14, the regional adjustment to the salary and benefits costs of teachers and other school personnel be based on the cost of housing in the counties in the State. 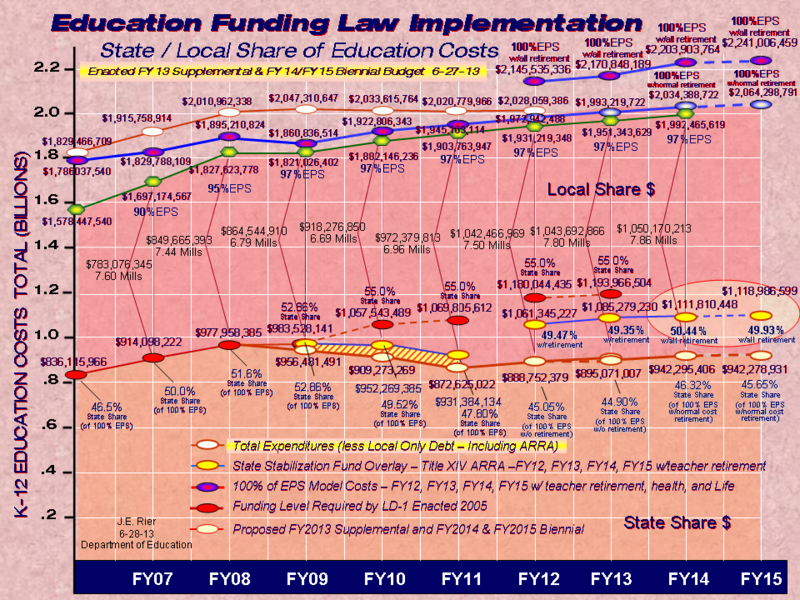 The bill also directs the Commissioner of Education, in conjunction with the Maine Education Policy Research Institute, to prepare a transition plan that addresses the development of the regional adjustment that is based on a cost of housing factor. ...amends the essential programs and services laws so that salary and benefit costs for school level teaching and nonteaching staff are treated equally throughout the State. ...1. It amends the definition of "property fiscal capacity" in order to base the local school administrative unit's fiscal capacity on the most recent certified state valuation or the average of the certified state valuation for the 3 years prior to the most recently certified state valuation, whichever is lower. 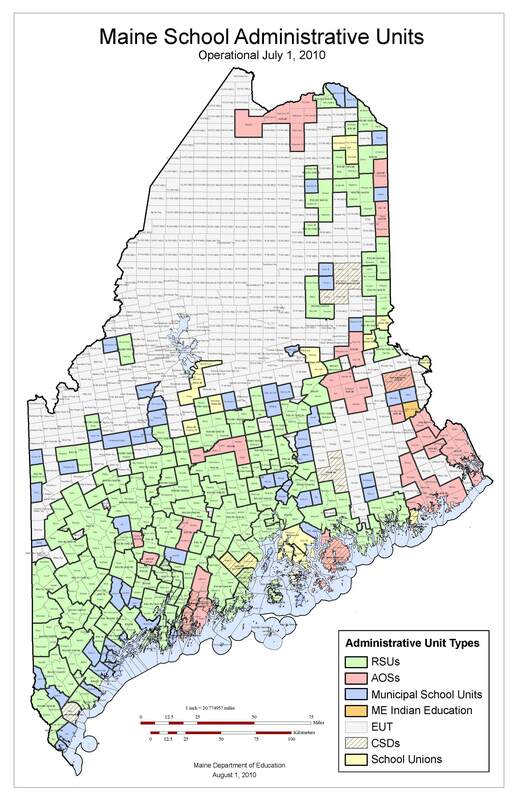 This change provides a more accurate determination of a school administrative unit's fiscal capacity while protecting those school administrative units that are experiencing increasing property valuation. 2. It amends the staffing ratios established to determine the calculation of salary and benefit costs for school-level staff positions by providing a 10% reduction in the staffing ratios for school administrative units with a total school population of less than 1,200 students. This change recognizes that school administrative units with fewer than 1,200 students still have to provide certain levels of instruction, support and administrative positions that do not conform to the existing staffing ratios, which are based on enrollment assumptions that do not apply to approved smaller school administrative units. 3. It amends the EPS per-pupil rate calculated by the Commissioner of Education for each school administrative unit by removing the reduction of federal Title I funds from the calculation for teacher salaries and benefit costs. This change reflects the fact that federal Title I funding is one of several sources of revenue that are allocated to school administrative units and expended to support essential programs and services. 4. It amends the regional adjustment in the total operating allocation for school administrative units based on the regional differences in teacher salary costs for the labor market areas in which school administrative units are located by removing the benefits costs for teachers and other school-level staff from the calculation of salary costs. This change addresses the inequitable treatment of school administrative units with lower teacher salary costs relative to statewide averages due to local economic circumstances.